Such a moment occurs in a very everyday task or activity when we realize we are in a perfect place in our life. That this is the place where the Almighty meant us to be. In these moments, we become aware that the path our Lord has led us down in life is perfect, as only His plan can be. I was blessed with such a moment last month while visiting the pond on the farm of one of my parishioners. The Official Parish Dog of the Presbyterian Church of Wilmington, Wally, needed a swim. Actually, he needed a bath; but he does not believe in soap and water, shampoo and groomers, perfume and blow dryers. So, my husband and I loaded Wally up in the car and drove out to the farm on a gorgeous summer day. The temperature was in the mid-70s and there was not a cloud in the sky. The corn on either side of the road leading down to the pond was as perfect as I have ever seen corn in July — coming from a girl from Iowa, that is something. The Lord’s beauty and the Lord’s bounty was abundantly obvious to all with eyes to see. 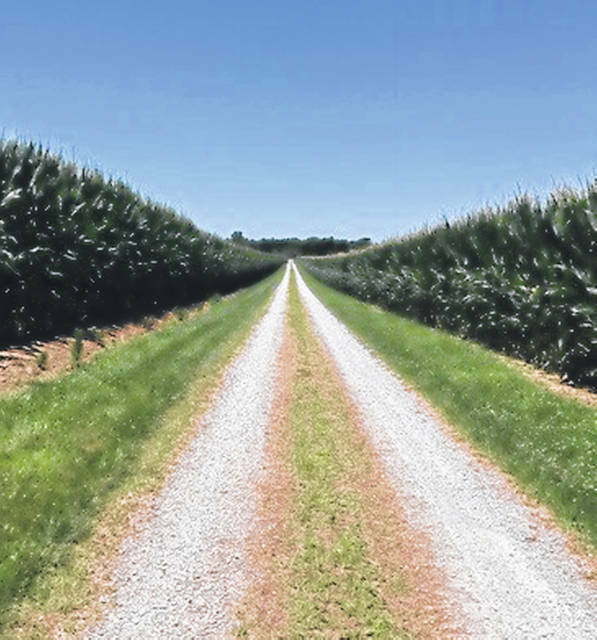 As we drove down the lane to the pond, I looked ahead and saw the clear straight path lined with regal rows of emerald corn leading to a brilliant blue sky and knew that this was the path the Lord had been leading me along all of my life. It was a path I never would have found alone. I have taken many exotic side trips, followed lots of crooked roads to dead ends and wandered far off the straight and narrow path that now lay before me. How then, was I so blessed to have found my way back to the path of life before me? Of course, I did not find my way back. The Lord led me back. In the last 60-plus years, I have seen more of the world than most folks. Life has allowed me to see some fantastic vistas, vast oceans, exciting cities and some just plain cool stuff. Ten, 20 or 30 years ago, if you had asked me where I would like to be at this point in my life, I am sure that driving down a country lane in southwestern Ohio to refresh an aromatic dog would not have been at the top of my list. I am so blessed that God’s list was so much better than mine. When I answered God’s call to His service in parish ministry, I had no idea that I would be blessed so richly. Perfect days are made perfect by the realization that God has made them. They are prefect because He gives us just what we need, in the place that we need it, and in His own time. Peace, real peace, is knowing we are doing just what God means us to do in the place God means us to be. Peace, the peace of God, is what I felt in the car on a summer afternoon, with my husband and a stinky dog, following a county lane toward a bright horizon. Life goes on and there are things that intrude on that special peace. Very real things intrude, like bills to pay, worries for my health and that of loved ones, world peace, deer eating my flower garden and on and on. However, the peace of that day is there, seared into my very soul. When my soul aches and questions come, I will always have the knowledge of the peace I felt looking down that lane. More importantly, I will have the sure knowledge that I have that peace because I followed God’s path for me. As long as I stay on that path, that peace will be everlasting.